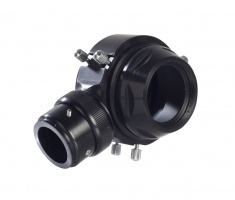 The Celestron Large SCT/EdgeHD Adapter was made especially for our Off-Axis Guider (#93648, sold separately). When paired, these two imaging accessories allow you to use the full image circle created by a 9.25”, 11” or 14” SCT or EdgeHD telescope. 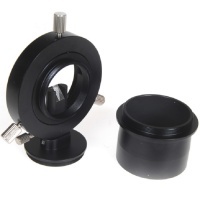 Designed for use with DSLR and CCD cameras, this low profile Off-Axis guider is a convenient alternative to using a separate conventional guide scope for astrophotography, offering several advantages. Using this OAG and a Baader T ring, you can guide any DSLR camera with no additional extensions of rings, or "Off Axis" by using a reticle eyepiece or LVI Smartguiders. The Off-Axis Guider is an essential astroimaging accessory for long focal length telescopes that require the most accurate guiding possible. The Celestron Off-Axis Guider uses a prism to intercept a small portion of the telescope’s focal plane (outside the field of view of the main imaging camera) to locate a guide star.